Easy -To-Use Design! Low Prices! Write information with any pen, pencil, or marker. Simply attach key - no ring is needed. Pre-punched and cleared holes eliminate mess. Arrow I.D. Tags are available in White, Yellow, Red, Green, Blue and Orange. Arrow I.D. 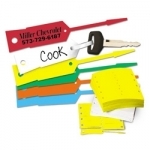 Tags can be custom imprinted in Black, Blue, Red or Green. Each tag measures 3/4" x 4 1/2" with 9 tags per 4 1/2" x 5 1/8" sheet. Tags are shrink-wrapped in packs of 1,000.